We went down to Gentle Paws to collect my Walk-A-Paw goodie bag and also wanted to walk some dogs. The volunteers entrusted the sisters Demsel and Diya to us. "They have to be walked together," said one volunteer. "Because Diya will lead Demsel, otherwise Demsel would not walk." 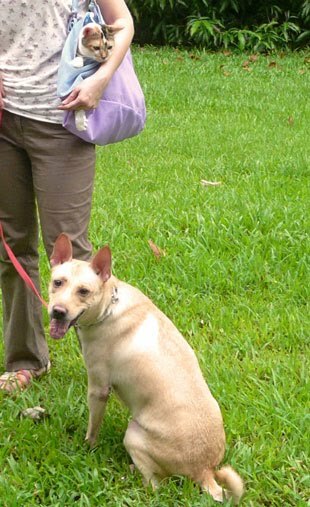 Demsel (brown dog, below) is a nervous dog. Her tail was always down throughout the entire walk. But she's also the one pulling Vincent forward. Diya (black dog), on the other hand, was very steady, calm and gentle. She would make a very good pet. Half time, we switched around, I was walking both of them for a short distance and then we decided to separate them and see what happen. Demsel led! She trotted beside Vincent but once in a while turned her head back to look at her sister. Maybe they can be walked separately, gradually. The whole family went to the park for a walk, with the cat too! We have never walked in a pack (family) of 4 before. Well, it wasn't exactly walking for Creme, she's in a pet carrier bag. She's quite fidgety when in the bag. Half of the time she would sit still being zipped up. Other times, she liked to pop her head out to smell and watch the surrounding. 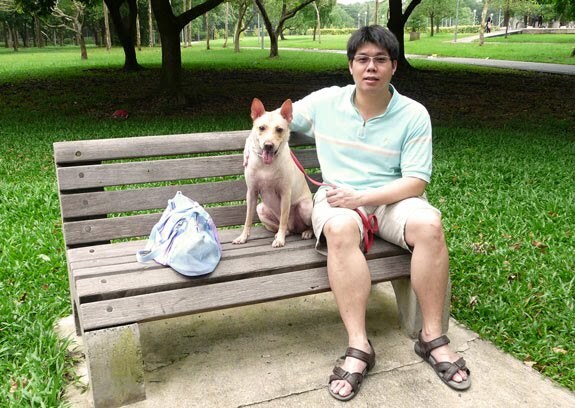 Whenever we took a rest sitting on a bench, Cookie would jump up the bench and sit beside us, as usual. She prefers sitting on a proper chair if she has a choice. It's a nice breezy day. It's very refreshing to walk the animals. Both animals had their long walks, individually. Here's Creme walking, and at parts running, on leash. 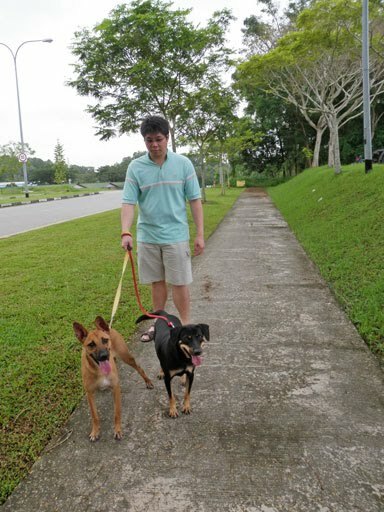 How I wish I can walk the animals like this everyday, no time limit, not hurrying to get back to finish up something. Looking forward to the coming long weekend!